The Japan Center for International Cooperation in Conservation started a new project, the “Networking Core Centers for International Cooperation on Conservation of Cultural Heritage Project for the Protection of Cultural Heritage in the Kyrgyz Republic and Central Asia,” in 2011. This project was commissioned by the Agency for Cultural Affairs, Japan and aims to train young experts in Central Asia in the protection of cultural heritage in Central Asia. 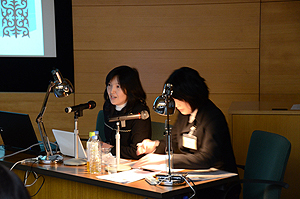 As a part of this project, three experts, Dr. Bakit Amanbaeva, Ms. Aidai Sulaimanova, and Ms. Ainura Tentieva, were invited to Japan and a seminar on “Cultural Heritage in the Kyrgyz Republic” was held at the Institute. Dr. Amanbaeva and Ms. Sulaimanova reviewed new archaeological discoveries in the Kyrgyz Republic and Dr. Tentieva spoke about Kyrgyz intangible cultural heritage.